The “Undisputed Kingz of American Psychobilly” are returning for a hometown show! Saturday, November 27th, Los Gatos Locos will be rallying up Jet Town’s juvenile delinquents for a rare ALL AGES event to be held at Motor. 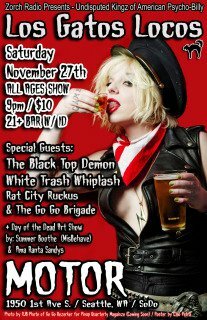 Opening up for them is Black Top Demons, White Trash Whiplash and Rat City Ruckus. This event will also be FILMED for an upcoming Los Gatos Locos DVD. Doors are at 9 and tickets are only $10. Zorch Radio will be giving way tickets to this event, alongside of a very special GRAND PRIZE package. The GRAND PRIZE winner will not only receive a pair of tickets to the concert, but they will also get to have members of Los Gatos Locos as guests for Thanksgiving dinner! Upload a copy of the flier for the November 27th concert to your facebook profile, then TAG as many friends in the photo as possible. Count the total number of TAGS, then submit a link alongside of the the total number of tags AND YOUR MAILING ADDRESS to Zorch Radio ( zorchradio@kgrg.com ) . The cutoff time for submissions is 8pm (Pacific Time) on Thursday, November 18th. The GRAND PRIZE winner will be announced LIVE on Zorch Radio during that evening’s episode. Second and third place will still receive tickets to the November 27th Los Gatos Locos concert. You can stream Zorch Radio every Thursday night from 10pm until midnight, PST on KGRG.COM and Real Punk Radio. -The winner’s location of the Thanksgiving dinner must be maximum of 50 miles from Seattle. -Members of the band will arrive around 7pm. -Contact information of the winner will be given to the band, who then contacts the winner personally. -Members of the band have the right to turn down the invitiation if necessary. -Winner will sign a waiver giving Los Gatos Locos the option to film the dinner event for use in a future DVD, if desired by the band. -Late submissions and will not be eligible. -Early submissions will not have their tags counted until Nov 18th. -Keep in mind that Facebook allows people to remove photo tags. This entry was posted on November 8, 2010 by Zorch Radio. It was filed under Events, Giveaways .